This is Fabio and his father Guido. 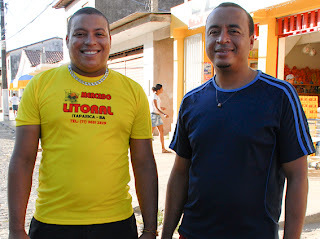 Guido owns and runs a grocery store called LITORAL Mercado in Itaparica Town. He set up the shop with and for his family. Because of the low income on the island – the average minimum wage being R$400 per month (£120) – the shop has to sell a little bit of everything at decent prices to keep itself going. They will also order items not usually available, especially for non-locals who might be missing something from their home town. One customer doesn’t like the bread so Guido gets different bread delivered by motorbike from the other side of the island. The store has been open since Carnaval 2007 and is one of a growing number of independent shops in a town where few existed five years ago. They offer credit for people they know – which is a typical system on the island – but need to manage it carefully so cash flow doesn’t put their business at risk. Guido worked for many years as a manager of a supermarket in nearby Bom Despacho, as well as a waiter at the local marina. Fabio said his father dreamed of opening up his own enterprise, so saved money until he was able to do so. With LITORAL he has generated relatively secure jobs for his family (children and siblings), which would have been hard to find elsewhere.